Clemson vs. Furman Clemson (24-23-1) will travel to Greenville, SC to play Furman (29-15 entering this week) at Fluor Field on Wednesday at 7:15 PM. Clemson will be the designated home team for the neutral-site game, which is the Tigers’ third-ever game on that field, and occupy the first-base dugout. On April 23, 2008, the Tigers defeated Presbyterian 12-7 at Fluor Field. Clemson also beat Wofford 12-3 on the same field in 2007. The game will be broadcast live on the radio by WCCP (104.9 FM) out of Clemson and can be heard live on the internet at ClemsonTigers.com. The Series Clemson and Furman have met 194 times on the diamond, with the Tigers holding a 133-57-4 advantage dating back to the 1896 season. Clemson’s first two games in school history were against the Paladins, both losses in 1896, which were the Tigers’ only games that season. The two teams have played at least one game every year since 1983. The two teams last played on March 19, 2008 at Doug Kingsmore Stadium. The Tigers won that game 14-2 behind two homers and six RBIs by Doug Kingsmore Stadium in the only meeting. The Tigers lead 8-3-1 in neutral-site games against Furman. The last time the two teams met on a neutral field was in May of 1976. 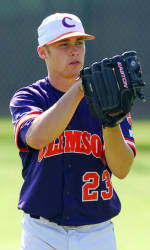 In the NCAA Atlantic Regional at Columbia, SC, the Tigers defeated the Paladins 13-2 on May 21. 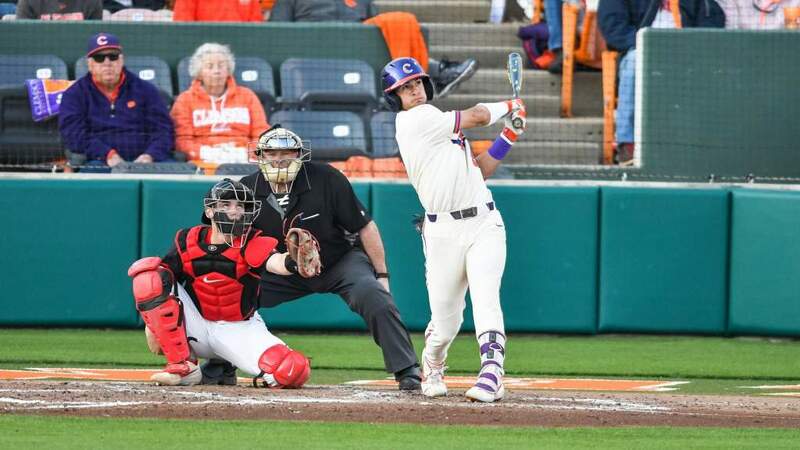 Three days later, Clemson won again 6-2, a victory that clinched the Tigers’ first trip to the College World Series in 17 seasons. 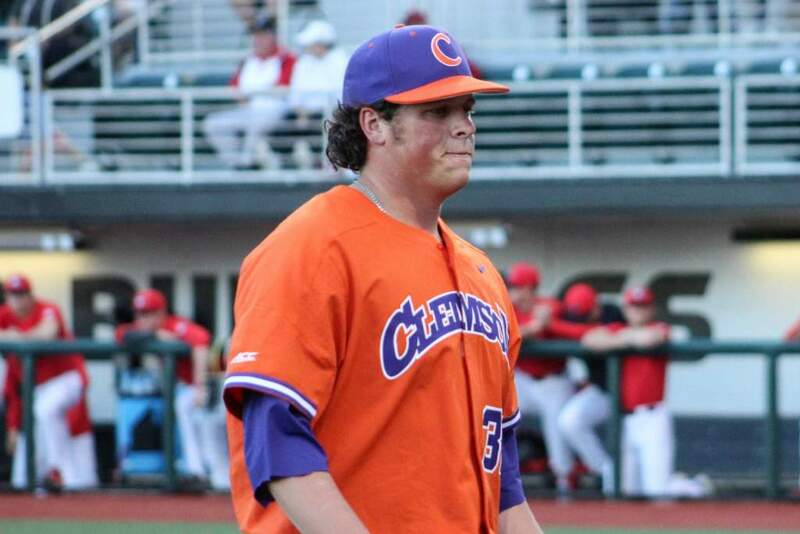 Jack Leggett is 13-4 against the Paladins as Clemson’s head coach. He was also 29-7 against Furman as Western Carolina’s head coach from 1983-91, meaning he is 42-11 against the Paladins as a head coach. The Starting Pitchers Furman will start senior righthander Mason Smith (5-3, 3.79 ERA) on the mound. The Columbia, SC native has made 12 starts and one relief appearance for a total of 59.1 innings pitched. He has allowed 63 hits (.270 opponents’ batting average) and 17 walks with 44 strikeouts. The Tigers will counter with sophomore righthander Justin Sarratt (1-2, 4.63 ERA) on Wednesday. The Gaffney, SC native has made one start and 21 relief appearances for a total of 35.0 innings pitched. He has yielded 45 hits (.328 opponents’ batting average) and five walks with 23 strikeouts. The Paladins Furman, led by 15th-year Head Coach Ron Smith, enters this week’s action with a 29-15 overall record and 15-6 Southern Conference mark after sweeping Davidson at home over the weekend. The Paladins, who have won 13 straight league games, have won six games in a row overall and 17 of their last 21 contests. The Paladins, who are scheduled to play Charleston Southern at home on Tuesday night, are averaging 7.1 runs per game and hitting .306 with a .385 on-base percentage. The team has also totaled 84 doubles, 11 triples, and 28 homers along with 52 stolen bases in 65 attempts. Reese Wade is hitting .464, while Jay Jackson is batting .319 with eight homers and 29 RBIs. Joey Rodgers has a team-high 20 steals in 22 attempts, while Marcus Rose has 16 stolen bases in 19 attempts. The pitching staff has a 5.07 ERA and .282 opponents’ batting average along with 312 strikeouts against 156 walks in 385.0 innings pitched. Sophomore righthander Nick Karow has a 4-0 record, 3.13 ERA, eight saves, and 32 strikeouts against just seven walks in 31.2 innings pitched over 25 relief appearances. Furman is fielding at a .964 clip as well. The Tigers Clemson enters Wednesday’s game against Furman with a 24-23-1 overall record and 10-16-1 ACC mark after falling in all three games against #3 Florida State at home from Saturday to Monday. The Tigers are 1-0 in neutral-site contests this season. The Tigers are hitting .281 with a .369 on-base percentage. Doug Hogan has added 14 doubles, two triples, 11 homers, and 48 RBIs, while Jeff Schaus is riding an 11-game hitting streak. The pitching staff has a 4.69 ERA and .285 opponents’ batting average. Matt Vaughn has nine saves and a 3.31 ERA in 24 relief appearances. The junior righthander has allowed just 10 walks with 35 strikeouts in 32.2 innings pitched. Clemson is fielding at a .964 clip as well. Tigers Up For One of Two ACC Tourney Slots The Tigers, who are 10-16-1 in the ACC (.389), currently stand in seventh place in the ACC standings, but they are only percentage points ahead of Duke (8-14-1 ACC (.370)) and a half game ahead of Wake Forest (8-15 ACC (.348)). The top-eight teams in the league standings will play in the 2008 ACC Tournament at Jacksonville, FL from May 21-25. Boston College and Maryland, who both have 8-19 ACC records, are still alive in the ACC Tournament race as well. Duke has two road ACC series remaining on its schedule, including series at Wake Forest and Virginia Tech. The Demon Deacons will play host to the Blue Devils and play at Boston College in their remaining two league series. The Tigers’ final ACC series of the season is this weekend at #25 Georgia Tech. Assuming every game is played and there are no ties, for Duke to finish ahead of the Tigers in the standings, the Blue Devils must win at least two more games than Clemson the rest of the way. For the Demon Deacons to finish ahead of Clemson, they must win at least three more games than Clemson the rest of the way. The oddities in the race are due in part to the weather. Clemson and Duke played to a 6-6 tie in 10 innings in Durham on April 20 due to unplayable field conditions after rain came through the area. The Tigers had taken an 8-6 lead in the 11th inning, but those two runs did not count, resulting in a rare tie. Both Duke and Wake Forest have also missed out on a game due in part to inclement weather. On Sunday, March 23, #5 Miami (FL) was leading Wake Forest 9-1 in Coral Gables, FL in the bottom of the fourth inning in game-three of the series. But inclement weather helped force the game to be cancelled. One week later, Duke led #3 Miami (FL) 1-0 in the bottom of the first inning in game-three of the series at Durham, NC. However, inclement weather helped force the game to be cancelled as well. Both Duke and Wake Forest went 0-2 against the Hurricanes, while the Tigers had an 0-3 record against Miami. Seminoles Sweep Tigers Florida State, ranked #3 in the nation, swept Clemson by a combined score of 26-14 at Doug Kingsmore Stadium from May 3-5. The Seminoles outhit Clemson .386 to .282 and totaled 14 extra-base hits, including six home runs. The Tigers, who were just 5-for-30 (.167) with runners in scoring position, only scored 14 of their 51 baserunners and left 32 runners on base compared to the Seminoles’ 23. Clemson turned seven double plays and committed only two errors on defense. Doug Hogan added five hits, a triple, homer, and five RBIs. In game-one on May 3, Florida State scored four runs in the 10th inning to outlast Clemson 9-8 at Doug Kingsmore Stadium. With the Tigers ahead 3-0, the Seminoles tied the score with three runs in the eighth inning. Florida State took the lead with two runs in the top of the ninth inning, but Hogan’s two-out, two-run homer in the bottom of the ninth inning sent the game to extra innings. In the top of the 10th, the Seminoles scored four runs on five hits and a costly dropped pop-up to take a 9-5 lead. Parker hit a three-run homer in the bottom of the 10th and Ben Paulsen hit a double to put the tying run in scoring position with one out. But Stan Widmann lined out to end the game. Florida State outhit Clemson 15-12, while the Tigers stranded 14 runners on base, including at least one baserunner in all 10 innings. Every Tiger starter had at least one hit as well. In game-two on May 4, four Seminoles hit a home run in Florida State’s 13-4 victory over Clemson at Doug Kingsmore Stadium. Florida State put six leadoff batters on base and tallied nine two-out RBIs along with 17 hits, including eight extra-base hits, in the contest. Five different Seminoles accumulated at least two RBIs, including three hits and three RBIs by Tony Delmonico. Eleven Seminoles had at least one hit and 10 scored at least one run as well. Clemson, who totaled 10 hits, was led by Ben Paulsen, who went 2-for-4 with three RBIs. Seminole starter Elih Villanueva pitched 7.0 strong innings, allowing only one run on six hits with five strikeouts to earn the victory. In game-three on May 5, Florida State edged Clemson 4-2 at Doug Kingsmore Stadium. The Seminoles took a 3-0 lead in the third inning on Jack Rye’s two-run homer. Dennis Guinn added a solo home run in the seventh inning. Hogan’s two-out, two-run single in the eighth inning cut Florida State’s lead in half. But the Tigers could get no closer. Hogan went 3-for-4 with two RBIs, while Widmann added two hits. Buster Posey had a game-high three hits for the Seminoles, who outhit Clemson 12-9. Starter Geoff Parker scattered eight hits and allowed two runs in 7.2 innings pitched to earn the win. Tiger relievers Casey Harman and Ryan Hinson combined to allow just two hits and one run with six strikeouts in 5.1 innings pitched.